Full of character yet minimal, we bring you the wonderful “Steira,” bursting at the seams with detail and functionality. Steira in all its glory! The sidebar is large in this theme giving you a lot of room to play. Any widget will do, but the custom widgets are quite convenient and stylish. The “Recent Comments” widget is especially nice. It shows a dedication to your content while at the same time keeping the visual intensity that the rest of the theme boasts. There are a lot of subtle details in this theme. Most notably, your newest post shows up with a nice “New” label, giving your users a heads up. If you’re wondering why you haven’t seen Steira before, it’s because you haven’t. It was designed by Made by Elephant for WordPress users. The theme will soon be available in the Theme Repository over at WordPress.org and we’re extremely happy to be sharing it with you today. Wow, this theme is gorgeous! It is so nice and clean and I love the New post feature. I’m going to try this one. This is a wonderful theme for photographers to display a bundle of photos in one place for others to comment on them. Love it! Cool theme!! Keep rocking WP.. I heart WP.. Cool indeed; but what I’d love to see is a theme with a flexible-width sidebar… any designers out there up for the challenge, please? This looks great. Nice, clean and organized. Keep up the good work. I feel vague about how, I can get my subscribers to sign up. To get my blogs. Any other advice? Nice clean look to this theme. I’ve just switched my blog to use it. A little problematic with the widgets set up… they all went into the “holding area”, with some odd (mainly empty) duplicates. Anyway, just had to move them back to where I wanted them. Also, some of the spacing could be improved, e.g. the RSS widget icon is displayed with no space on the left side… perhaps this could be changed? Other than that, I’m liking the new look. The gallery for photos looks interesting! Thanks so much! Me like. I’ll try it. I’ve gotten so used to INove. Sleek and classy. Another stylish addition…congrats! Thanks for all your cool themes. I just love them all. It is interesting, however, I wish the date would show as, ’02/07/2010′ rather than 07/02/10. thanks again! good things about WP keep on coming this month! I tried a white background, but ended up back to basic black. I’m still waiting for a new black theme that would be an easy transfer from the one I’ve got…. Looks very exciting! Will surely try this soon. Looks like a WordPress.org theme! Please give a theme which has categories navigation in the header nav bar. Wow! Nice! Clean & simple! If the preview is any indication, it messes with my weekly comic because the image space is smaller, and there’s no custom header. I won’t be using this one. Another great theme. I will preview it and pass it on to a friend I know who wants to change their theme. We really like this cherry tree! LOL. that’s pretty silly. It looks pretty cool….. I’ll give it a shot !!! Awesome! I will definitely check it out. This is really cool. Will definitely try this out this week. Good work guys, keep it up. sepertinya bagus nih… looks good..
i’ve been looking for a blog template like this and thanks to you guys at wordpress my content actually fits my template. mind taking a look? I am one of those who are reluctant to change. Actually I am happy with the theme I have been using since I started with W.P. So, even though it looks nice, I prefer to stay where I am. However, very grateful for all the works you guys have done for our blogging community. W.P is my super star! i know i’ll like it. Looks like a fun, clean theme. The specialized layout on individual posts with the comment box at the side rocks. Thank you Made by Elephant! Nice! I’ve been waiting for new themes. The Theme page doesn’t list its capabilities. Fixed width, flexible width, colours, headers, what? Will find time to look at it before I give my final comment. Meanwhile, let me join others in appreciating your effort. Simple, clear and modern ! Thank you. But it seems everything under bullet points and block quotes comes in ALL CAPS. Which is like you want to SHOUT on readers. Nor quite right and appealing I feel. Can we have it corrected please. We need a theme like vigilance which lets us select a background pic along with colors. It’s too simple, in my opinion. I think you should add many more themes with much colour. 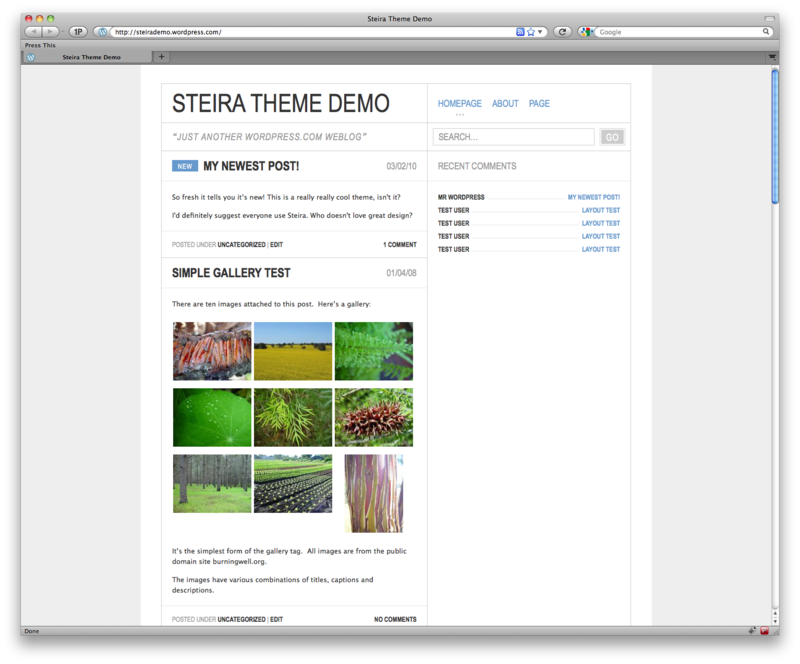 I also think that you could let us personalize the themes and blogs more.Or, maybe, you could add an theme uploader. i don’t know if you would take in consideration what I’ve written here, but I have hopes. Wow another new theme, well done. I agree with what’s her name. I’d like to see the “New” feature for the most recent post get added to other themes. Good work though. Clean and simple combination of text and gallery. I would say it definitely has a minimalist esthetic. I’d say that’s a great quality to have – but I love that look. Don’t worry, we have lots and lots of themes coming out! Do the designers you commission ever complain about having such a narrow colour palette to work with? There are a lot more themes coming (soon), some have lots of color! Also, why is the demo blog locked? Are you trying to bump the ‘theme change’ stats by forcing people to enable it on their own blogs to check it out? It has some display problems with PicApp images. If they are aligned left or right it leaves no margins around them, just butts them up against the post border and the same with the wrapped text which looks ugly to me. The same with the RSS links icons (unless you opt for the text only look) which are also aligned touching the border without any margin. Normal images seem to display OK. I also notice if you do a short posts and a PicApp image extends below the text the themes doesn’t recognise that and starts the next post overlapping the image -oops. Also blockquotes display more as ‘pullquotes’ rather than normal blockquotes. My juries out at the moment – I like the clean simple look, but it is a bit clunky around the edges and as with all WordPress themes not user tweakable to sort them out. I can only give it 6/10. I like the ‘new’ bit. But Noel, your earlier ‘monochromatic’ theme was much much better. We’re expecting more from you now! Nice…but I would like some more themes along the lines of Cutline or Freshy. I really like that style. i think this is a great theme for someone who likes to do photofeatures. absolutely great. i can now think of toying with photofeatures. Nice! I love this theme! If only someone made one that fits me! I hate wide sidebars. For one, they take up blog post space. Secondly, it’s distracting. Someday, someone should make a theme with an auto-hide sidebar. Thanks. Agree with phoxis. We need more wide themes like Journalist v1.9. Any updates on this one coming? We’ll definitely keep that in mind! Thanks! I do not mind it but… why so many themes like that? I use Vigilance and Journalist but the likes of it are so few. Please, please add more themes which have wider text space and not such big spaces on the left and on the right of the screen. @countryclubhousewife315: If you’re having trouble posting to your blog, please contact support. ( * * * * / 5 ) for the Fresh Clean Professional look. Would be really impressive for a TECH blog. the theme really looks clean, it seems this theme will load faster. i would prefer a wider post column, because it’s the main place where quality bloggers keep playing. but this is a good theme for those who write average length content. Loving the clean look, looking forward to more! It’s not wide enough in the writing area for my liking though I am pleased to see you guys getting some more themes for WordPress.com. There just isn’t enough choice I don’t think.